A 14-year-old nanotechnology company building a new type of computer memory with a material that is stronger than steel and less dense than aluminum has raised $31.5 million in a Series E round of funding. Nantero, based in Woburn, MA, has raised $78 million since it was founded in 2001 by a trio of Harvard alums: CEO Greg Schmergel, CTO Thomas Rueckes, and COO Brent Segal, who has since left the company. The round, which was originally disclosed in February in a regulatory document, included undisclosed strategic investors and existing investors Charles River Ventures, Draper Fisher Jurvetson, Globespan Capital Partners, and Harris & Harris Group. Nantero’s technology is intended to replace flash memory and DRAM (dynamic random-access memory), boasting the former’s permanent storage capabilities and the latter’s density and speed, as Xconomy wrote in a 2008 profile of the company. Called NRAM (nonvolatile random-access memory), the product is being installed in multiple production fabs and designed into new electronic products, Nantero says. The company says it has more than a dozen corporate partners, though it did not disclose who they are. NRAM not only combines the benefits of flash memory and DRAM but also costs less to produce that than each of those technologies, Stefan Lai, a former Intel senior executive who is joining Nantero as an advisor, said in a press release. Lai co-invented Intel’s EPROM tunnel oxide flash memory cell and led the company’s phase change memory team. Yaw Wen Hu, a previous executive vice president and current board member of Inotera Memories, also joined as an advisor. The NRAM memory chips are made using carbon nanotubes—cylindrical tubes of carbon atoms that are tiny, strong, and have better thermal and electrical conductivity properties than any other materials, the company says. 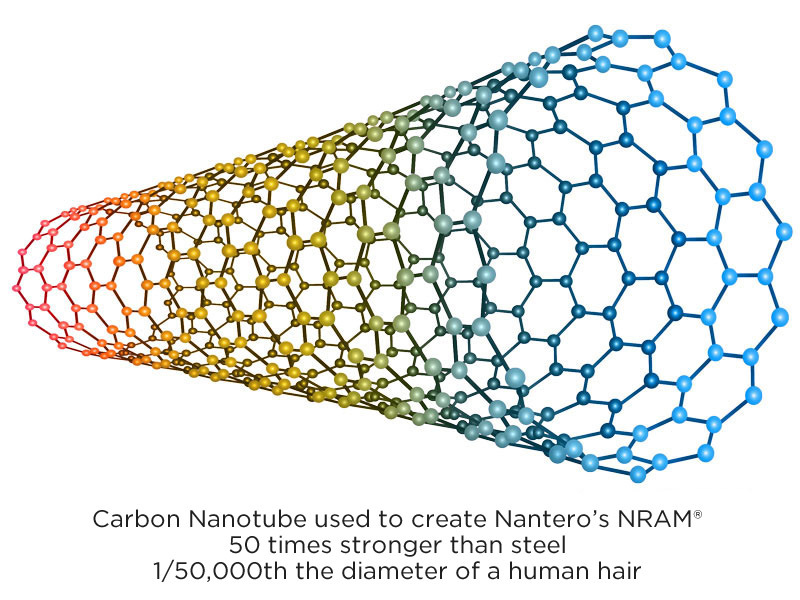 Nantero says that it is the first company to develop semiconductor products using the nanotube technology.The tubes are one-fifty-thousandth the diameter of a human hair. The cylinders are 50 times stronger than steel, and have half the density of aluminum, the company says. 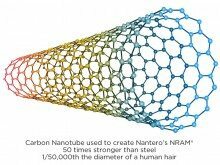 Nantero has more than 175 patents to date in its carbon nanotube electronics patent portfolio, with more than 200 pending, the company says. It has earned more than $50 million in revenue. Nantero intends to target consumer electronics, mobile computing, wearables, and government and military spaces, among others. Nantero says that NRAM could reduce cell phone costs and power consumption by consolidating multiple memory chips into one. It could also allow tablets to have similar performance to laptops, the company wrote in a presentation announcing the new funding. The company now has 50 employees, slightly less than the 60 it employed when Xconomy profiled Nantero in 2008. It plans to use the latest funding to further commercialize and produce the NRAM chips. The company’s business model is focused on licensing its IP to major chip manufacturers, foundries, and electronics companies, Nantero says.